Admission into Pitt Business is your passport to a world-class education in the United States. 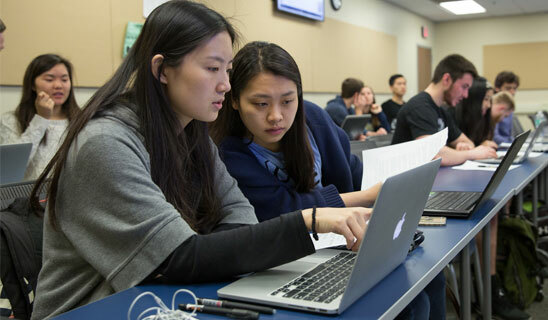 International students represent a relatively small portion of the class (approximately 8 percent of enrollment) but are a highly valued population in Pitt Business. Domestic students benefit from their interactions with foreign students, as it exposes them to the viewpoints and nuances of different cultures. Business professors are concerned with addressing global issues in the classroom and appreciate the diverse perspectives offered by international students. The business curriculum provides a strong international component, helped by the fact that faculty members have themselves lived, traveled, worked, and taught around the globe. International students are assessed tuition as out-of-state students. Current tuition, and fees are available from the Office of Institutional Research. Application deadlines and the admissions process for international students. #11 Ranked Public Business Program in the United States!